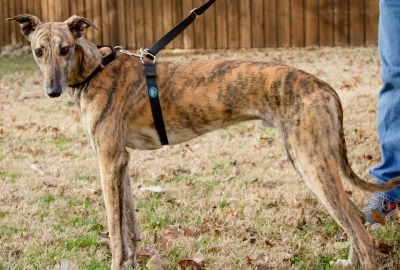 Nathan is an approximately two year old brindle male who was found as a stray and picked up by Fort Worth Animal Control and Care. He is tattooed, but they are too faint to be legible. He arrived with a wound on one hip, which is healing. Nathan has completed all of his medical procedures. It is not known at this time if Nathan is small animal of cat tolerant. Nathan is such a sweet, beautiful little boy! Nathan is quite shy and reserved so he takes a little time to adjust to new surroundings. He does not enjoy being in a kennel for long periods of time but will quite happily go in there to be fed. We found Nathan does better when he can roam the house with our other dogs while we are not at home. He often chooses to lay in the dog bed right in front of the window at the front of the house as that’s where he can see any action going on. He also likes to move things...particularly shoes but he is never destructive. He just likes to disburse them randomly throughout the house. He loves belly scratches and squeaky toys and quite often he can be seen taking a toy to a bed with him for a cuddle. Nathan is a velcro dog and wants to be with you all the time and is very curious about what you are doing.